On February 27, 700 people took to the streets in Seattle to show their support for the Bernie Sanders campaign. 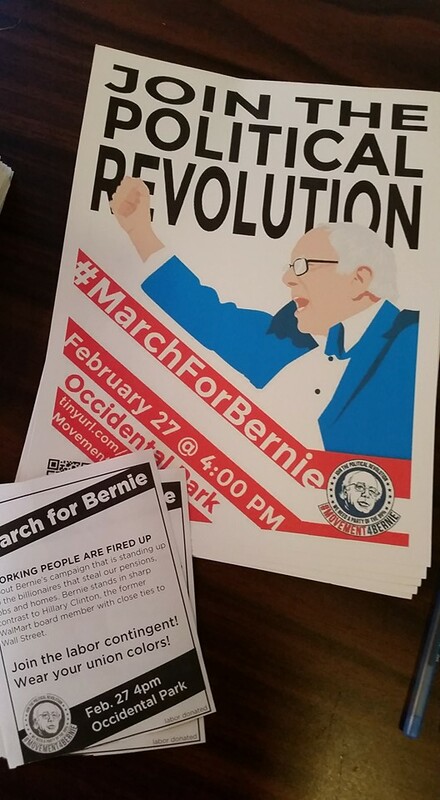 The spirited march joined marches planned in 75 cities across the country for the second national MarchForBernie. Bigger than the first MarchForBernie in Seattle, the excited marchers were clearly motivated to fight for the rights of ordinary people. Proof of this was the powerful chorus of chants heard throughout the march from “Banks got bailed out, we got sold out!” to “Whose lives matter? Black lives matter!” It was especially inspiring given that the majority of the march goers were young people and women. The march was kicked off with a stirring speech by Socialist Alternative organizer Kailyn Nicholson who stated emphatically what the march was there to do: “We are here to fight for universal health care, for free education, and to spread the fight for $15 minimum wage across the country.” With that, the march began to wind its way through downtown Seattle stopping at a few locations to drive home the points of the march and the call for a political revolution. Next, the march stopped at the much reviled Wells Fargo. The march goers’ fury was stoked by a blistering indictment of the banks by James Khan. From the bailout of the big banks to Hilary’s cozy relationship with Wall Street – receiving $3 million in speaking fees – and reminding people that Clinton blamed homeowners for the housing market meltdown that sparked the Great Recession. James showed, in no uncertain terms, that we cannot trust Clinton to regulate Wall Street in any meaningful way. The march ended at Westlake center where several speakers from the labor movement and the Sanders Campaign fired up the crowd on how to elect Bernie. Socialist Alternative Seattle City Councilmember Kshama Sawant gave the final speech to the crowd in which she warned the crowd that the disappointing results in South Carolina and Super Tuesday will be hard for Bernie, and the media would try to write Bernie’s obituary. Outlining the corrupt nature of the Democratic Party establishment, she drove home the point that Sanders should run all the way, even if that meant running as an independent. Many of the speeches cautioned against supporting Clinton, pointing out that she is not an effective fighter against the far right, represented by Donald Trump, that we must continue building the movement for a political revolution, and that we ultimately need is an independent party representing the millions not the millionaires. Next articleBernie vs. Hillary: What’s A Feminist To Do?